Recently, I was in a group of church leaders, Pastors and Elders, as we discussed how to make congregations more vital. Every time I am in this type of gathering, I am both saddened as well has filled with hope. I believe that one of the greatest obstacles facing the Church is that it is so focused on the past. Even people who weren’t involved in the church in the past have a grand impression of the church’s past. Christian cultural dominance of the past has led to what is viewed as a high water mark of the church. We are bound to that past like a stone around our neck. It drags us down and under. This is what truly saddens me. Good, faithful, loving Christians, who see what they are doing as being lesser because it doesn’t look, like the past. One thing that I have come to value about the coach approach to leadership and life is that while the past can be informative, we must focus on future reality. We all remember when Churchill used the phrase, “Those who fail to learn from history are doomed to repeat it.” It is true; we need to learn both the positives and negatives of the past. Congregationally the stories we carry forward tell us a lot about who we are. The problem is that we often allow those stories to determine who we will be. As people of an ancient sacred story, we value our past, without it we actually don’t have a common calling. That being said, the future is where we live. As a coach I try to help coachees get beyond the past and more into a new imagined future. This is where my hope comes during my work with the Transformation Team of the Presbytery. Using all the tools available, we seek to help congregations to look for the ways God is bringing them vitality today and into the future. This can be hard to imagine when small budgets and large buildings bog us down. This past weekend I was blessed to hear stories of churches taking seriously the task of using their prophetic imagination to see a different way. At Christ Presbyterian we are blessed with a rich history. That history is filled with success and failure. We have seen times of dynamic growth and sagging attendance. That dynamic history has brought us to this point. As a congregation we are challenged to discern the vital future God is calling us towards. This past Sunday during worship our Preschool Director, Diane Volcansek, shared with the congregation a new vision for our preschool. Here is where our past could drag us down. Our rich tradition of half-day preschool is a precious memory. Many of our members and friends saw their children’s lives touched by the love and learning provided by it. Fear says, if we make these changes we will lose that gift. Prophetic imagination asks us to see beyond the fear. Using the gift of our past, combined with discernment about our neighbors and their needs begs us to make changes. These changes are both exciting and scary. I am reminded of the Magic School Bus books and cartoons that Colin used to love. 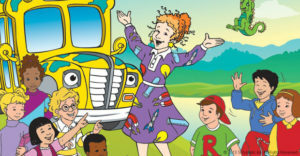 In every story, Miss Frizzle would take the children on an adventure. As they loaded up on the Magic School Bus, she would remind the children what their classes mantra was, “Take chances, make mistakes, get messy!” Miss Frizzle’s words ring true for Christ’s people as we seek to live into a vital future. We have to put the past in the past, trust God for a vital future and take chances, make mistakes, get messy! The adaptation of our Preschool is just one example of how Christ Presbyterian is leaning on the promises of God as we take those chances, make those mistakes and get messy. We have other areas of our life together that we will need the Magic School Bus mentality. I hope that you will pray that God will continue to lead us as we seek to discern the hope-filled future of Christ Presbyterian Church. Unfortunately, I was not there to hear Diane speak about the new vision for CPC Pre-School. However, I am excited by this new venture. I think it truly speaks to the needs of our community today, It appears to keep the best of the “old” with a new outlook toward the future. Congratulations to the team that is making this a reality.